MobiKwik India’s #1 Wallet to make secure and fast payments now allows its users to withdraw or transfer cash from MobiKwik Wallet to bank account. Yes MobiKwik has recently launched the most awaited feature which its registered users were waiting for long time that is to transfer money from MobiKwik Wallet to Bank Account. 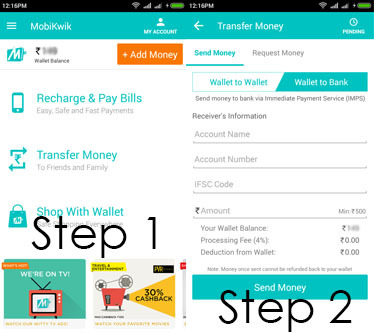 So in this post we will guide you on How to Transfer Money from MobiKwik to Bank Account, below is the step by step guide which you will need to follow to be able to transfer money from your MobiKwik Wallet to your Bank Account. Download and Install MobiKwik App on your smartphone device, and once you have successfully installed the app MobiKwik just launch the app and sign in with your MobiKwik Account Credentials. In MobiKwik App home screen you will find Transfer Money, just tap on Transfer Money option from the app home screen. On tapping Transfer Money it will navigate you to Send Money option, In Send Money there will be two options Wallet to Wallet and Wallet to Bank. So to Transfer Money from MobiKwik Wallet to Bank Account you will have to tap on Wallet to Bank option. On tapping on Wallet to Bank option you will have to enter the bank account details like Account Name, Account Number, IFSC Code and the Amount in which bank account you want to transfer your MobiKwik Wallet Cash. Once you enter all the bank account details just tap on Send Money to transfer your MobiKwik Wallet Cash to bank account. To complete the transfer request you will have to complete the verification steps by entering the OTP which you will receive on your mobile number. Funds transferred from your MobiKwik Wallet to your Bank Account will get Immediately reflected in your bank account as the funds will be sent via Immediate Payment Service (IMPS). 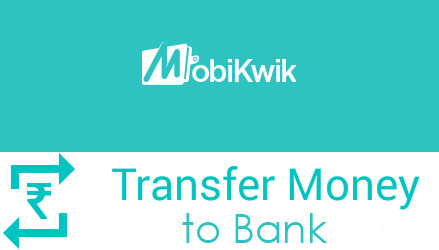 MobiKwik will charge 4% processing fee to transfer funds from your MobiKwik Wallet to Bank Account. Maximum limit to transfer money from MobiKwik Wallet to your Bank Account via IMPS is Rs.1,000/- per month and you can do two transactions in a month for Rs.500/- per transaction. As of now this feature to Transfer Money from MobiKwik to Bank Account is only available via MobiKwik App and not via MobiKwik Website.